The Russian BIAS in War Thunder on the example of the T-34-85. Although the Russian developer of War Thunder always denies repeatedly: the bias is real and unmistakable. 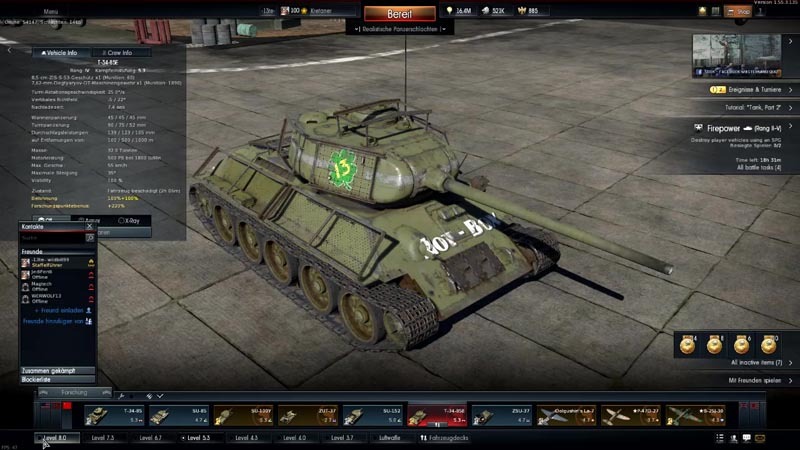 Russian bias in War Thunder on the example of the T-34-85. You have to understand that the T-34 is a well-known Russian tank from WW2. Historically, it was a revolutionary design, which in 1941 formed an unpleasant surprise for the German troops. The model T-34-85 was built in 1944 and is armed with the more powerful 85 mm gun and is located in War Thunder on the BR (Battle Rating) 5.3. By comparison, the Tiger I (commissioning in late 1942) and Panther D (early 1943) is located on the higher BR 5.7, although both tanks are about one year older models. Nevertheless, 44,900 T-34 (82% of total production) were lost during WW2. This is about half of the tank losses of the Red Army. Please click on the start button for this c.5 min video ! On T-34-85 hardly any serious damage occurs, while its gun can often shoot off easily – with a single shot – most opponent tanks. Additional to that, the extremely low BR-classification of 5.3 as medium tank, whereby the T-34-85 only costs 280 points compared to 450 points of the heavy tank Tiger I ! The effect of the 75 mm gun of the Panther is relatively weak in War Thunder, whereby this also medium tank (and is considered by many experts to be realy the best tank design of the war) is rarely used as a competitor, especially since its BR is higher settled. Thus, the Tiger driver is forced on the mostly small, chaotic battlefields with frequent close-quarter fights of the game to achieve far more kills without being knocked-out by a single shot (the so-called ‘one-shotting’). On the other hand, the player of a T-34-85 can unabashedly push forward and often capture CAPs because of his high speed. He simply can remain on his luck because of the somewhat unrealistic bouncing physics of shells – or in the case of a penetration that not much damage happens on his tank. Similarly, if he should be unlucky times yet, he can easily get back into battle with an other vehicle or plane because of the low points which his tank costs. Moreover, on all the battlefields, the starting positions of the Russian team is fix established and are most times better than for the opponent team (more or better protected positions to rush and capture the CAP-points etc). The all-time top-19 tanks of the author in the win odds. When the first four and the other British tanks (and which are ‘cut-down’ in their performance in the meantime) are not considered, because they were played only a few times, remain virtually only Russian vehicles with the highest win ratios of 86.6-64.7% on the first page. Todays tip: who wants to come quickly forward on the Russian Tech Tree or additionally wants to earn a lot of the in-game currency Silver Lions should concentrate on the T-34-85. And who wants (could) to invest some real money: the acquisition of the Premium package of T-34-85E therefore is worthwhile. By contrast, at the moment players of other nations should make a big circle around vehicles with the Battle rating range from 4.3 to 6.3 ! Despite such problems, the tactical options, vehicle setups and use of aircraft over the battlefield makes the game still superior to its competitors. War Thunder is crap. The problem is the computer bot tanks never miss, they know the terrain and go right to hull down positions that are impossible for human players to emulate with the limited vision options we get. Also, the system appears to jack up the computer opponent based on the level of vehicle you are using. This is to get you to spend an ever increasing amount of money to upgrade your tank out of frustration. The modeling of the vehicles bears no resemblance to fact. I’ve had a Tiger tank blown up by a 40 mm anti aircraft gun. The game is ridiculous and I stopped playing it months ago. Only a fool would invest money in it’s game play. There are also only bots for your first couple matches and they are really really bad, they drive into buildings, miss their shots and shoot at angles that are 100% ricochets. If you even were versing them (which you weren’t) and you died then I’m sorry to say, but you are very bad at the game. Gee too bad they didn’t have your genius back in the 1940’s. You could have explained that to them and they could have equipped all their main battle tanks with 40mm bofors guns and saved a lot of tankers lives. Your notion of ballistics is crap. The 40mm gun didn’t have enough propellant, mass or penetration no matter what you might think. They got rid of 50mm antitank and tank guns for that very reason. The only thing Battle Thunder gets right is the money making system it uses to drain the bank accounts of tank fan boys like you. Despite what you might think, gaming a video game is not real life. I developed software for a living, and software models can do whatever you want them to do. Battle Thunder is optimized to make money. Period. It is not realistic. You cannot trust the Stalin era production statistics. Here is a story to let you know why. Stalin gave a speech about grain production and said the nation’s production would increase to 72 million tons. The Agriculture Ministry reported that growth had stagnated and only produced 62 million tons the same as the year before. Stalin had everyone in the Ministry arrested and along with their families sent to the Gulag. The lesson was you report what the quota was set at, not the real numbers. Factory directors learned the lesson well. Russian losses were so high both in men and materials that tanks were sent into combat without paint in some cases. Losses in men were so great that they were being sent into combat half trained and unarmed, so the Soviet army did not get better, they just flooded the Germans. The allied aid was in large part all that helped the Soviets hold the line after the devastating losses in the first two years. That and the opening of five “second fronts” that the Germans had to siphon troops off to deal with. North Africa, Sicily, Italy, France and the Air War. The Germans lost the war due to logistics in large part due to production from the West. Without the 500,000 wheeled vehicles and 1200 locomotives sent to them they would have had to walk carrying everything else produced a lot fewer tanks. So which ever way you want to look at it, their great offensives never would have happened without western aid and they never would have recaptured their lost territory. Point of fact is they may have won the war but never fully recovered and that fact played into the collapse of the USSR in the 1990s. Don’t get me wrong, I am no fan of the Germans, but I can read and interpret data. Regimes who see the truth as something to manipulate to their own ends don’t selectively lie. They lie about everything. After the Wall came down, it was pretty obvious that anything written based on facts “known” before 1990 was based on Stalinist propaganda. The book, The Tiger’s Are Burning written by a respected aviation writer, claimed based on Russian figures, that more Tiger tanks were destroyed at Kursk, than had even been manufactured up to that point by German industry. It is also interesting that you are hard pressed to find any pictures of US or UK made tanks or planes in Soviet Service. Again a direct result of Stalin’s view of the world and the war. The M-4A3E8 Sherman seemed to make easy meat out of the T-34/85 in Korea. The ability of Russian tanks has always been a fiction of Stalinist propaganda and continues to this day. The IDF made mincemeat out of Russian tanks in the Middle East as did the US in Kuwait and Iraq. Russian armor has in the main provided western tankers with target practice. What they are good for is running over unarmed or under armed civilians as they did in Hungary and Czechoslovakia, Clones of Russian tanks did the same thing in Tiananmen Square. I totally agree with Keith Patton in everything he said here. 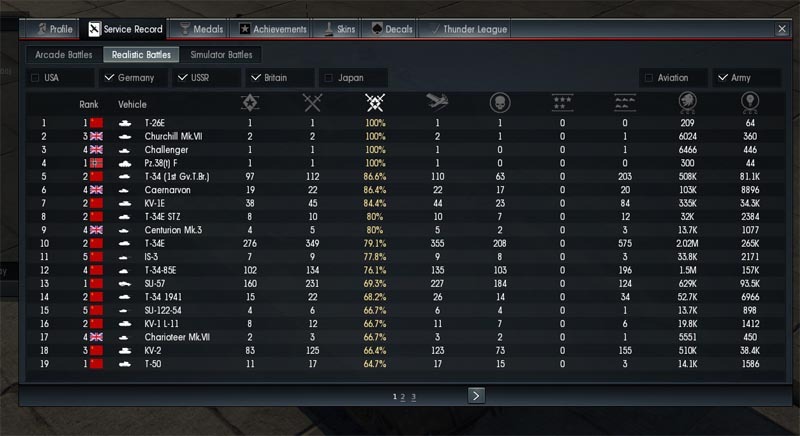 I played War Thunder for more than a year now, I also have some programming background, and it is the most rigged game I’ve never seen.